A colleague asked us the other day what would be our top 10 tips for using social media as a marketing tool and it occurred to us that we hadn’t blogged about social media strategy for a while. Bob wanted to know why we felt a social media strategy was important and what its impact was on marketing, SEO (search engine optimisation), even website design and then the overall business. So we thought about this and here’s our top 10. Social media needs commitment – time for authoring content and time for interacting. Don’t do it if you are not prepared to make time. Be totally objective. What do you want to achieve by using social media? Remember that everything you post is now in the public domain – permanently. Does your next client need to know how many pints of lager you consumed with your rugby mates on Saturday night’s curry-fest? Optimise your website and remember that social media is great for search engine optimisation. This will focus you on the topics to blog/interact on and help you with important keywords. Google ranks sites now on social media authority – take advantage of this – and many will allow you links back to your website – don’t miss this opportunity and use anchor text if you can. Be interesting – try and be an authority on what you do best. That way people will want to engage with you. Reply if people connect or comment on your posts. Interact – ask questions. Find people with common business interests – engage – help them first. Always keep your profile current and keyword rich – choose a great username that involves keywords if appropriate. 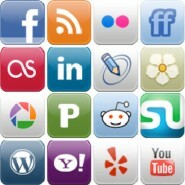 Use social media sites that can integrate. For example, Facebook can link with Twitter so that any status update on Facebook reflects as a tweet, or vice-verse and Twitter can integrate with Linked in so any tweets update automatically on your LinkedIn profile. You cannot manage it all without some automation – use Hootsuite or Tweetdeck to monitor important contacts and their social media activity. You can also schedule tweets. Watch out for new social media sites. They might be the next Twitter or FaceBook.